Bolted to DC for two days; Hirshhorn, Yves Klein, blue girls in black in white. Flat fields, objects, moonscapes – all in that vibrant vibrating blue that seems to absorb sound and light alike. A self made monograph of color field paintings cut out of commercial paint chips. Blowtorches and firemen, Yves Klein always in a suit. Evening spent on the front porch of my parents house listening to the tree crickets and katydids, the sound of car wheels on the long descent down the hill on the highway marked the passage of time through the infinitely throbbing chorus of insects. Next day in the Tower at the National Gallery, listened to the Menil Chapel Rothkos hum. Sat down to watch them move as day went from sun to shade and the colors of the paintings changed with the light – the way water changes – a grey day turning a pool into a mirror. Rothko’s blacks are hardly so black – they are darkness stained with color: red, violet, green, the sheen of light turning a form into a slate of grey, while another form becomes a void. Small French paintings in the basement, a whole room of little Vuillards! 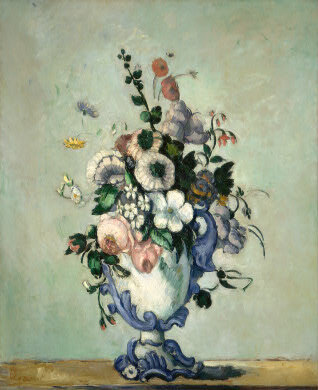 My favorite french painting was upstairs: a Cezanne “Flowers in Rococo Vase”. 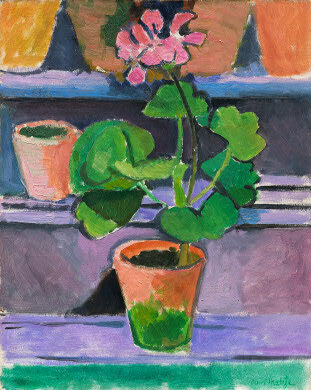 Brought back a postcard of another, a Matisse, not on view, that I wish had been.